A sea of black-clad mourners massed across Bangkok’s historic heart Thursday as funeral rituals began for King Bhumibol Adulyadej, a revered monarch whose passing after a seven-decade reign left Thailand bereft of its only unifying figure. As dawn broke an estimated 200,000 Thais had gathered around the Grand Palace to bid an emotional farewell to a monarch known as “father of the nation”, silently packing the pavements, many clutching portraits of the beloved late king. The golden spires of a spectacular $90 million cremation site, purpose-built for the funeral, were bathed in light as Bhumibol’s son and heir, King Maha Vajiralongkorn, joined Buddhist monks to start a day of sombre processions, colourful pageantry and religious ceremony. Vajiralongkorn will light the funeral pyre at 10pm (1500 GMT) as his father, Rama IX of the Chakri dynasty, is laid to rest. The ceremony will be attended by a “Who’s Who” of Thai power — royals, generals and establishment figures — as well as scores of foreign dignitaries. The lavish event gives the public a chance to say a final goodbye to a king who was crowned in 1950 and towered over decades of Thai history, before his death last October aged 88 seeded uncertainty in a country ruled by a divisive junta. A brew of palace propaganda and a harsh lese majeste law burnished the king’s reputation throughout his reign. But Bhumibol’s intimate connection with his subjects was on ready display Thursday. Bearers in bright coloured traditional garb, flanked by pipers and drummers, carried a symbolic Royal Urn on a palanquin to a temple, an artillery-salute setting the tempo. 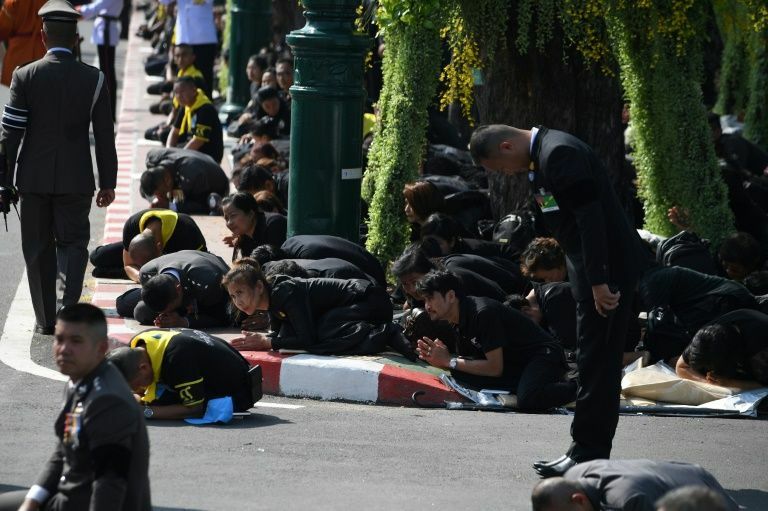 As the urn passed by many mourners fully prostrated on the ground, a once abolished practice brought back during Bhumibol’s reign, while others burst into tears. “He was perfect. He helped the country and Thai people so much. Seventy million Thai people are united in their love for him,” said 65-year-old Wacharadej Tangboonlabkun, who like most Thais knew no other monarch before Bhumibol’s death. The death of a figure of constancy in a politically combustible country has dipped the kingdom into uncertainty. “There’s no more a father who only gave to his children,” 47-year-old mourner Kingkan Kuntavee told AFP. For much of Bhumibol’s long reign, Thailand remained stuck on a carousel of violent protests, short-lived civilian governments and coups. Political turmoil threw up an endless supply of junta leaders and prime ministers, but all lacked Bhumibol’s moral capital with the Thai people. He left behind one of the world’s richest monarchies, that stands at the apex of one of Southeast Asia’s most unequal societies. Deference towards the monarchy — and the social elites it underpins — is a given in Thailand. 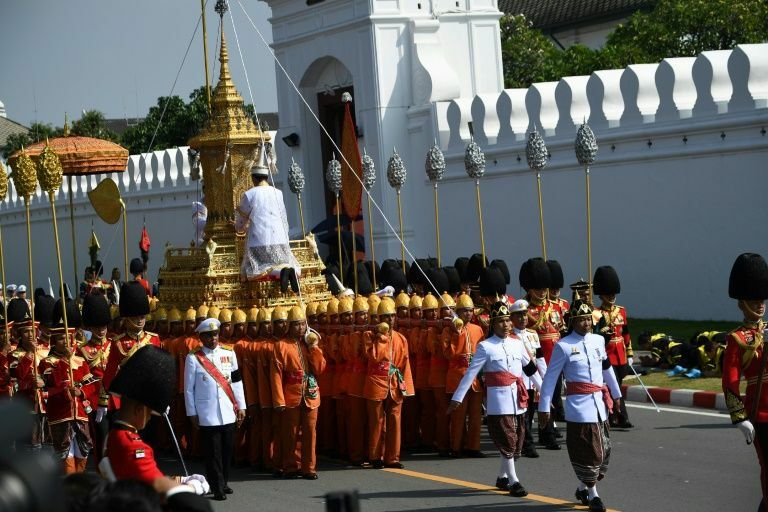 Ahead of the processions, palace aides shuffled on their knees in the presence of the new king, as monks in orange robes chanted Buddhist prayers. The new king, who wore full military regalia as he joined the procession, will be crowned after his father is laid to rest. He has yet to win the same affection among the Thai public as his father, whose image was carefully curated by palace PR, cementing a reputation as austere, benevolent and incorruptible despite the fast-changing times. Thailand’s royal defamation law shields the monarchy from criticism and scrutiny, carrying 15-year jail sentences for each charge. That law makes independent analysis and frank public debate about the monarchy impossible inside Thailand. In effect it means the monarchy “has monopolised the way the Thai public can think about its own political story,” historian David Streckfuss told AFP. The ruling junta has jailed record numbers of people under the law since seizing power in a 2014 coup. Aged just 18 when he ascended the throne, the US-born Bhumibol became the fulcrum of the monarchy. The crown flourished with heavy US backing as Washington sought a bulwark against the spread of Communism across Southeast Asia. Thais have donned black for much of the last year in a remarkable outpouring of grief, which officially ends on October 30.